It hasn't been pretty, but it's been effective. For the first time since Jan. 21 to Feb. 3, 2011, the Flames have won six games in a row. How long ago was the last six-pack of victories? Consider this: Johnny Gaudreau was playing hockey in Iowa for the Dubuque Fighting Saints, 16-year-old Sean Monahan was a rookie for the Ottawa 67s and Sam Bennett was dominating the floor hockey module in grade 9 Phys Ed class. The latest win in what's been a December to remember came Tuesday night in Nashville and it came after an opening 20 minutes that for Calgary was the equivalent of being driven over (and then backed over and driven over again) by a paving truck. In the first period, the Flames looked awful as they were completely out-hustled, out-muscled and out-everythinged by a dominant Predators team. But to their credit, the visitors settled in, were the better team over the final 40 minutes, then won it in overtime per the usual script. All of a sudden sitting one point out of second place in the Pacific Division, here are eight items to ponder. The dynamic 25-year-old, who plays like a forward trapped inside a defenceman's body, has been on a tear lately offensively. With Patrick Kane's 26-game point streak over, Brodie now owns the NHL's longest active points streak at seven games (2 goals, 6 assists) and he's actually not far off having the second-longest point streak overall with nobody except Kane having reached double digits. Earlier in the year, David Krejci, Bobby Ryan and Erik Karlsson all reeled off nine-game point streaks. There have been another eight players that went eight games before being blanked. The point streak is also a career-best for Brodie, who previously had never strung together a point streak any longer than five games. It's been a long and steady climb but Karri Ramo has his save percentage up to .903 now. It's not quite the high-water mark for the year but is darn cose. He was at .904 after his first two starts before giving up four goals on 18 shots against Washington on Oct. 20, which resulted in him promptly being put on waivers. In starting 16 of Calgary's last 19 games, Ramo is proving to be the better choice between he and Jonas Hiller and now it's up to him to prove he's also a better choice than other goaltending options around the league potentially being considered by general manager Brad Treliving. What's been most remarkable about Ramo's season has been his play in overtime. 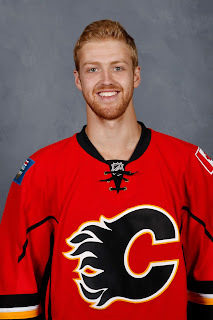 The unsung hero in the Flames 8-1 OT record has been the 29-year-old Finn as don't be fooled by Calgary's record, the shots on goal in extra time have been 23-23. While Calgary's goaltending has put up a .957 SV%, opposing goaltenders -- mind you, they need to stare down Gaudreau all the time -- are at a meager .652 SV%. That's over .300 points lower. Whoa. Individually, Ramo has a .941 SV% in overtime (16 saves on 17 shots), which in itself defies all conventional logic given the quantity of good scoring chances you typically see at 3-on-3. Mind you, Ramo seems to be at his best on the real dangerous chances. He's put together quite a highlight reel package this season alone. For him, it's the not-so-good scoring chances that end up in the net that has been his biggest issue. It was after the Flames 6-3 drubbing in Denver on Nov. 3 that coach Bob Hartley decided it was time once again to shuffle up his defence pairings. This time, he tried something new by putting Kris Russell and Dougie Hamilton together. After a rough start in his new organization, Hamilton had seen his game stabilize just prior to that during a four-game tour of duty on the third pairing with the surprisingly steady Deryk Engelland. Russell and Hamilton have been a tandem ever since, other than the three games Russell missed last week due to his hand injury, and it's worked out terrific for both. A look at Russell's stats prior to and after being paired with Hamilton reveals two very different seasons for the 28-year-old from Carolina, Alberta. Regardless of what stock you put in the plus/minus statistic, the difference between minus-15 and plus-10 is massive. Right across the board, Russell's numbers have gotten significantly better. Hamilton's turnaround has very much mirrored the Russell turnaround, only it started 10 days earlier. As you'll recall at the start of the season, finding the right mate for Hamilton took a while. He started the year with Mark Giordano and that was a disaster. They had about as much chemistry together as Fez and Jackie from That 70s Show. Mind you, the first time Hamilton partnered with Russell wasn't a smashing success either with rock bottom being the game in Brooklyn on Oct. 26 when both players were a minus-3 in a lackluster 4-0 loss to the Islanders. Hamilton was subsequently dropped to the third pairing with Engelland in an experiment that lasted four games and seemed to get the ex-Bruin on track. Since being re-connected with Russell after that, it has gone a lot better. Here's a look at Hamilton's stats prior to being dropped to the third pairing on Oct. 28, which also coincided with Brodie's return to the Flames line-up after opening the year injured. Like with Russell, it's been the tale of two seasons for the Hamilton. 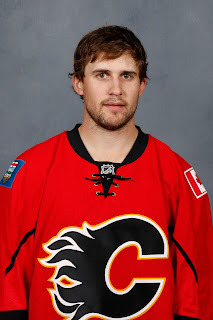 Hamilton has found his game defensively and he has become more comfortable with the the Flames expectations of their defence and being that second wave of attack up the ice. The result is he's had an impact, is noticeable and in a good way and has more closely resembled the player Calgary thought they were getting when they traded three draft picks to get him in the summer. With his perfect saucer pass to Russell for the game-winner on Tuesday at 1:23 of overtime, Gaudreau tied an NHL record with his seventh overtime point (3 goals, 4 assists) of the young season. Per Elias Sports, only two players since overtime was introduced in the NHL in 1983-84 have had seven points. With seven points in 11:13 of 3-on-3 ice time, Gaudreau is basically creating a Flames goal every 96 seconds he's on the ice. If you widen the scope to dangerous chances created, those are probably being generated every 30 seconds. If you ask opposition goalies how often they're staring down No. 13 in all alone, they would tell you it feels like every 15 seconds. For a little guy, he's becoming a giant nightmare for opposing goalies. How can the Flames be so lethal at 3-on-3 yet so awful at 5-on-3? So bizarre. Honestly, next time they get a two-man advantage, send Engelland and Matt Stajan over the boards with the sole purpose of circling behind the Calgary net and intentionally firing the puck over the glass for a delay of game penalty. First, let's be clear, I'm no power play coach. But one observation is that the power play doesn't seem dangerous when the players are stationary. Passing the puck around the perimeter while not actually changing one's position on the ice doesn't seem to accomplish anything other than taking time off the clock. When you're not moving, the penalty killers can remain in their same spot and can take away the shooting lanes more easily. By rotating around the outside or mixing in some other movement, you open up seams to pass the puck cross-ice, you open up shooting lanes and it forces the defenders to track you and that increases the opportunity for a mistake. The man advantage has only one direction to go but goodness, the path back to respectability will take a while. The Flames would have to go 4-for-4 on the power play next game just to climb out of 30th and that would just barely get them to 29th. With Michael Frolik heading back to Calgary, that means he's at least lost to the team for a while. One positive ramification of that is now the Flames won't have to make a roster decision when it comes time to activate Lance Bouma from injured reserve. It's not known how quickly that move will happen but it's simple now, Frolik onto the IR and Bouma comes off the IR. 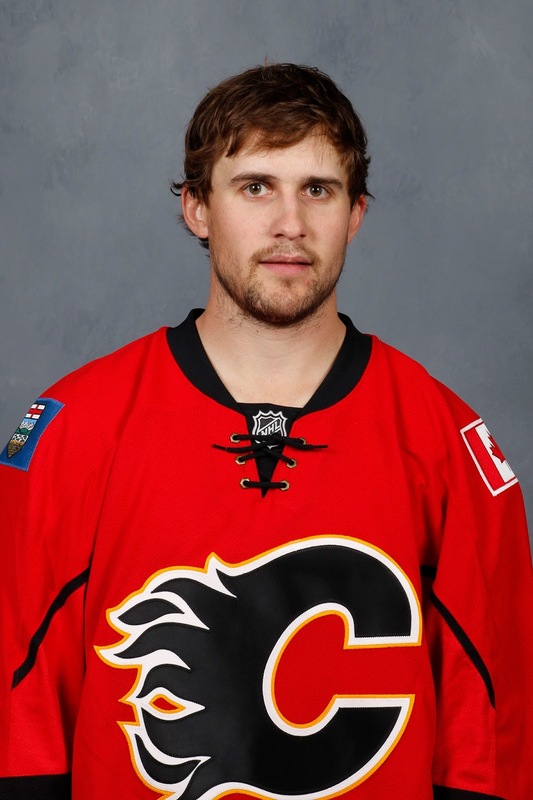 What's interesting will be the repercussions on the Calgary starting 12 at forward as a result of Frolik's loss. We've seen Bouma and Mikael Backlund as a combination plenty before so that would be least disruptive to a team that has its four lines going pretty good these days. So my guess is when ready -- whether it's later this road trip or once the team returns home, Bouma inserts right into Frolik's spot but on left wing with Mason Raymond sliding over to his off-wing. In the meantime, as was the configuration at Wednesday's practice in Dallas, it's Josh Jooris that gets another chance as the right-hand shooting sophomore was dropped straight into Frolik's spot. Jooris hasn't played in the past six games and it is on him to make the most of what may be a limited opportunity to get back into good standing with the coach before the time comes when Hartley must pull someone out of the line-up to find a spot for Bouma. Frolik's loss is a tough blow as he's come as advertised after signing a long-term deal with Calgary in the off-season as a free agent. It's also a hit for the already-bad penalty kill, which like the PP is also ranked 30th in the NHL. Now we wait to see how long Frolik's absence will be. More on this later in the week once the Doctors check him out. One reference you will never hear me use audibly or in print is the NHL's version of the .500 mark because it's bogus. Saying the Flames are finally back at the .500 mark today is misleading. What they are is back to the NHL's fake .500 mark. There's a big difference. If you haven't heard my rant on this before, here it goes. Every win, however you can get it is, is considered a 'regular' win by the NHL. They all go in the win column and that's fine. Where the inconsistency comes in is losses are treated differently. If you lose in overtime or a shootout, the NHL doesn't view that as a 'regular' loss and instead there's a separate column for that. By doing this, the league creates this make-believe world where win-loss records across the league look better than they actually are. Apparently this is good for business. It's conceivable that all 30 NHL teams could be above the .500 mark at the same time, which underscores why the reference is so inaccurate. A true .500 mark is one in which roughly half of the teams are above it and half of the teams are below it. Here's an example. As of Wednesday morning, the combined record for all 30 teams is 463-350-113. That's right, the league on the whole is 113 games above .500. It's ridiculous. Calgary's true record if you treat wins and losses equally would be 14-16 instead of 14-14-2, so two games below .500. That said, I'd suggest a more practical and telling .500 mark that the Flames should be striving to get back to is their win-loss record in regulation time and they're a long ways away from that. They're nine games under .500 when you view it with that lens with an NHL-low five regulation wins versus 14 regulation losses. Thursday night in Dallas represents the stiffest test on a difficult road trip. However the Flames enter that game with confidence and swagger not just because they've reeled off six wins in a row, but because they played the Stars tough when they met at the Saddledome two weeks ago. While it took a three-goal third period comeback to get the victory that night, Calgary was the better team by far over the final 40 minutes of regulation with a 28-11 edge in shots. It was a complete effort that if they can duplicate at American Airlines Center will give them a chance to make it seven wins in a row. When is the last time they hit that number? For that, you need to go all the way back to right after the 2004-05 lockout. From Nov. 1-16, 2005, the Flames reeled off eight straight victories. I have no idea what to expect Thursday night but given how unpredictable the season has been, I won't be surprised whatever the result ends up being. Looking at the bigger picture, the key is securing at least one more win out of the final three stops -- Dallas, St. Louis or Detroit, as given the caliber of opposition, four points on this roadie should be considered a success. Although, getting greedy for more -- like five or six points -- isn't a bad thing, even if it is Christmas. Just be polite about it. With respect to the mythical .500 mark, you fight the same fight I did when people celebrated the mythical Millennium in 2000, as opposed to the actual Millennium in 2001. It's important to fight for what's right!